1With color A, cast on stitches. Cast on the number called for in the pattern that you’re making. 2Work 2 rows with color A. 3Drop color A and start knitting with color B.
Don’t cut color A; just leave it hanging. 4Work 2 rows with color B. Again, follow your pattern for how to work these rows. 5Drop color B and pick up color A. 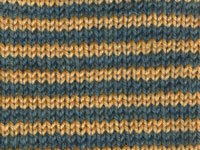 6Continue working each color for two rows apiece as you follow the knitting directions in your pattern. 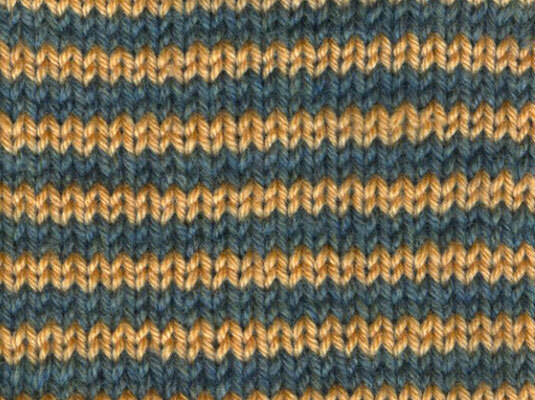 Because the stripes are only 2 rows long, you don’t need to cut the yarn between stripes, and you won’t have extra ends to weave in.